Put the yeast, sugar, olive oil and water into a large mixing bowl or a Cambro 6 quart storage container. Stir to mix. In a separate bowl measure the flour, salt and the 12 seed and grain mix, stir with a whisk to combine. Mix the dry ingredients all at once into the yeast and water mixture. Using a wooden spoon or a stand mixer with a dough hook, start stirring around the outside of the container. Stir until the flour is absorbed. This will take a minute or so, and the dough should be loose enough to conform to the shape of the container. Cover the dough with a lid but don't snap it closed, allow one side to be slightly opened. Or, drill a small hole in the top of the lid (before making the dough). Allow the dough to rest at room temperature for 2 hours, or until double in bulk. The dough is now ready to shape, rise and bake. Lay down parchment paper on a cooking sheet and sprinkle with corn meal. Sprinkle the top of the dough with a little flour (about 2 tablespoons) and remove it from the container. Dust a clean counter with flour and knead the dough a little, just to remove any air bubbles. Shape the dough into a loaf and place it on the parchment paper sprinkled with cornmeal. Allow the dough to rise double in bulk, approximately 45-90 minutes (there's no need to cover the dough). Dust the top of the loaf with a little flour. Make slashes about ¼" deep with a sharp knife. Preheat oven (along with a cake pan or a broiler tray) to 450° F. Put the bread dough in the hot oven and carefully pour 1 cup of water into the cake pan or broiler tray (not to get any water on the glass oven door) and close the oven door to trap the steam. Bake approximately 25-30 minutes, or until the bread is golden brown and firm to the touch. 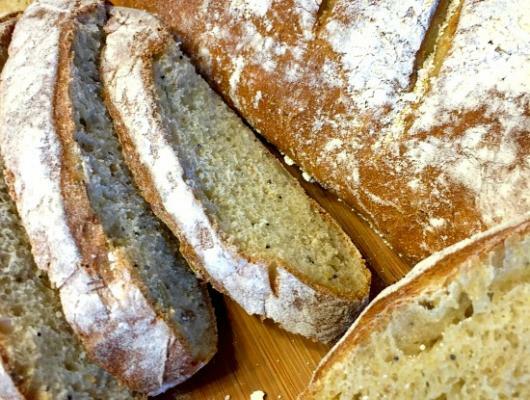 Immediately slide the hot bread onto a cooling rack to keep the bottom of the bread nice and crusty. 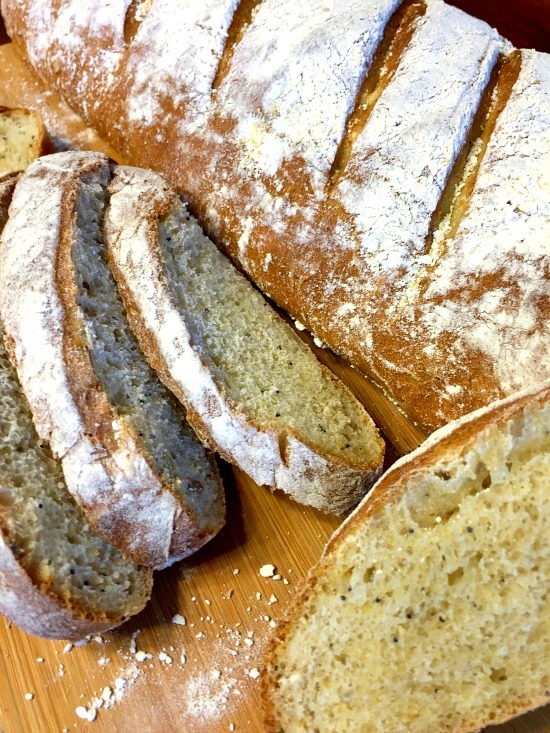 Our Crusty Artisan 12 Seed and Grain Bread has a crusty, chewy texture and goes perfect with many meals!